A new study, based on longitudinal data from the German Study on Aging, Cognition and Dementia in Primary Care Patients (AgeCoDe), suggests that temporal stability versus instability of an individual’s report of subjective worsening of cognition over time plays an important role with regard to whether such experiences are associated with future dementia risk. These findings, which will be published in the Journal of Alzheimer's Disease 54(3), add to a constantly growing strand of research on the phenomenon of “Subjective Cognitive Decline” (SCD) in Alzheimer’s Disease (AD). While SCD may often accompany regular cognitive ageing processes, research over the past two decades has suggested that it is also among the earliest clinical symptoms of AD, preceding the clinical stage of “Mild Cognitive Impairment”. Due to this early manifestation, SCD has significant potential to be used for identification of individuals with increased risk of preclinical AD. Prior research has already shed light on some of these aspects, Dr. Wolfsgruber explained. There is evidence that e.g. the notion of a decline in memory as opposed to other domains of cognition and the presence of worries about the self-perceived cognitive decline are particularly predictive for AD. 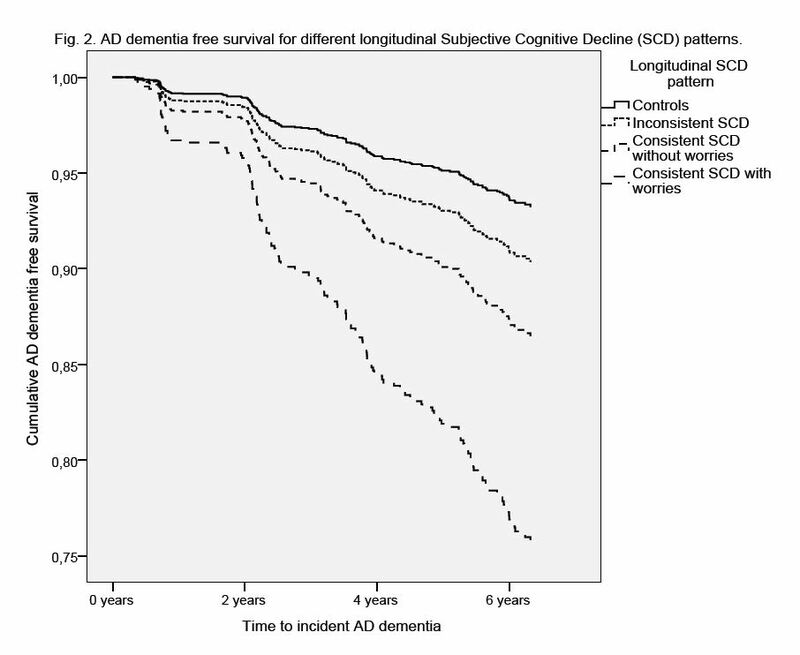 The authors of the study now investigated whether longitudinal data on SCD also bears important information regarding AD dementia risk. With AD being a progressive neurodegenerative process, the authors hypothesized that longitudinal stability of SCD may be associated with increased risk of AD dementia. Wolfsgruber and his colleagues analyzed data of 1,990 cognitively normal participants from the AgeCoDe study, a large, general-practice based, longitudinal multicenter cohort study of non-demented individuals aged 75 years or older at baseline. They assessed SCD in the memory domain with vs. without associated worries at baseline and at first follow-up 18 months later. Based on these two assessments they classified patients into groups with stable vs. unstable SCD response patterns and estimated risk of future AD dementia for each group during subsequent follow-up of up to 6 years. Results of these analyses showed that, compared to cognitively normal individuals who reported no SCD at both baseline and follow-up, those with a temporally inconsistent report of SCD were not at increased risk of future AD dementia. However, risk was doubled in individuals reporting SCD consistently at baseline and first follow-up. Finally, risk was almost 4-fold increased for individuals who, in addition, endorsed worries about their self-perceived decline consistently over both measurement occasions. Wolfsgruber S, Kleineidam L, Wagner M, Mösch E, Bickel H, Lϋhmann D, Ernst A, Wiese B, Steinmann S, König HH, Brettschneider C, Luck T, Stein J, Weyerer S, Werle J, Pentzek M, Fuchs A, Maier W, Scherer M, Riedel-Heller SG, Jessen F; AgeCoDe Study Group (2016) Differential Risk of Incident Alzheimer’s Disease Dementia in Stable Versus Unstable Patterns of Subjective Cognitive Decline. J Alzheimers Dis, doi: 10.3233/JAD-160407.